This is such a happy clown figurine...designed, hand painted and signed by Ju Di. 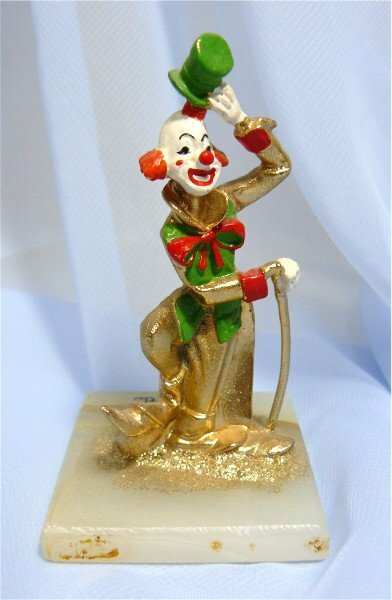 This series of clown figures were set on marble bases, painted in bright colors, and embellished in 24K gold...this one is almost "coated"! He stands 3-3/8" tall and has a base measuring 1-7/8" to a side. With a tip of his hat and a foot in the air, you wonder whether he's about to make an entrance or is in the middle of great dance routine. This neat fellow is bound to bring a smile to your face each time you look at him! Make him yours!